I don't know why I haven't used this service more often than paying for parking at SFO. Its so much cheaper to take a cab and these guys definitely come on time to pick you up. From Daly City, it was around 20 dollars and 10 minutes. The cab driver was also pretty nice and courteous. One thing you should note is that cash is the preferred method of tender. 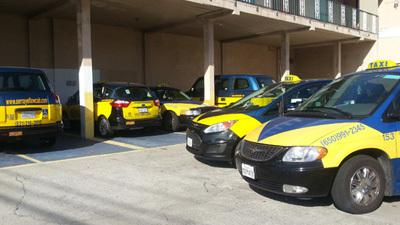 At Serra Yellow Cab, we offer speedy and reliable dispatch service to and from Daly City, Colma, Brisbane, Pacifica, Broadmoor, Millbrae, Burlingame, Hillsborough, Foster City, Belmont, San Carlos, Redwood City and SFO. We are a local company focusing on excellent local service. We feature state-of-the-art computerized dispatch. This means faster service that is more reliable. We believe that a taxi service should be your safe alternative to driving, which is why our courteous drivers are all licensed and our cars are well maintained. Our drivers are experts on the area and know all the fastest routes and hottest spots. Whatever your destination, we'll make sure you arrive on schedule and relaxed. Whether your needs are corporate or personal, Serra Yellow Cab always delivers a reliable, efficient and elegant transportation experience. We recognize that your time is important and you deserve the utmost quality in professional ground transportation. For premium chauffeur and taxi services, look no further than Serra Yellow Cab! Serra Yellow Cab is concerned about customer satisfaction. We provide the most reliable, fastest cab service available to and from the airport and around town.